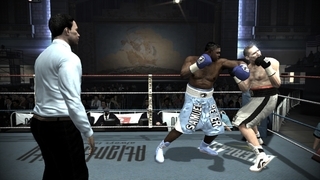 Ecco alcuni codici per bloccare extra e personaggi nel gioco di boxe Don king presents:Prizefighter per Xbox 360. Per vedere il video Great Moment in Boxing selezionare l’opzione Extras e poi digitare il codice 1BESTBUYBEST per sbloccare i video. Signature Smash Down! (5 points): mettere KO un avversario con un Signature Punch. Training Game Superstar! (30 points): Raggiungi World Champion in tutti i training games. Loser! (3 points): Perdere 3 combattimenti in a row. Team Calzaghe (30 points): Vincere combattimenti online sia come Enzo che Joe. Top Form! (25 points): Raggiungi World Champion in tutti i training games. Sinister (5 points): Sconfiggere l’avversario usando un Southpaw boxer. The King of Queensbury (25 points): Completa tutti i Classic Fights. Jab Master (20 points): realizzare 1000 Jabs in ogni modalità di gioco. Hook Hero (20 points): realizzare 1000 Hooks in ogni modalità di gioco. Uppercut Machine (20 points): realizzare 1000 in ogni modalità di gioco. Twinkle Toes (20 points): Rack up a ring mile. World Champion (50 points): Diventa campione del mondo nella Career Mode. First Steps (5 points): Diventa Pro nella Career Mode. Easy Pickings (20 points): sconfiggi Nino Basilio. Judge Dreadful! (20 points): mettere KO Dave Saddler. One Armed Bandit (20 points): mettere KO Sven Zurilo. Blind Fury (20 points):mettere KO Vassily Kablov. 3ml of G? (20 points): mettere KO Milton Forrest. New Kid On The Block (5 points): Creare un Career Boxer. Going the Distance (150 points): Completare Career Mode. Platinum Puncher (100 points): Completare Career Mode con Champion difficulty. Xbox LIVE Journeyman (5 points): Vincere 5 ranked fights. Xbox LIVE Contender (10 points): Vincere 15 ranked fights. Xbox LIVE Champ (20 points): Vincere 35 ranked fights. Xbox LIVE Legend (40 points): Vincere 50 ranked fights. Long Way Down (42 points): Battere tutti gli avversari in Career Mode. Tournament Champ (30 points):Vincere a Ranked Tournament. Who’s Winning Then? (10 points): Gioca 10 back to back in multiplayer games.